Translated chunks of code can be hard to test outside the environment in which they were designed to site. There comes a time when end to end tests are required, before any data has been migrated and before the system is complete. 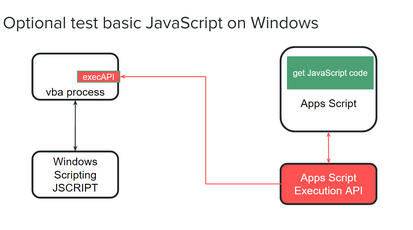 Using the Execution API, it is possible to retrieve code from Apps Script modules, and to run them on the PC under the control of VBA and in place of the VBA code they replace. Not all code is suitable for this treatment, but pure logic code could be. Not only that, but the results can also be tested against the original VBA code in place. This small demonstration is drawn from the example in this section. The purpose of this Apps Script function is to generate a regular expression based on the contents of the column of a lookup worksheet. At this early stage in the process, no data has been moved (it’s still in Excel), and no other functions have been written in Apps Script. This is a generic VBA function to provoke execution of a function on Apps Script to return requested source code. This function is expecting to be asked to return the source code of an array of modules and optionally, an array of function names within modules. It’s not perfect as it’s clearly not a code parser, but it can find the common function constructs. If no function names are provided it returns the whole module. Finally it adds the source code retrieved by the Execution API from Apps Script, and executes the new function, getRegex, with the argument of the lookup data retrieved from excel. Clearly this technique is not for all code, but it can provide a really useful comparative testing environment for early code conversions. Being able to test logic in the same environment at the same time has huge potential.